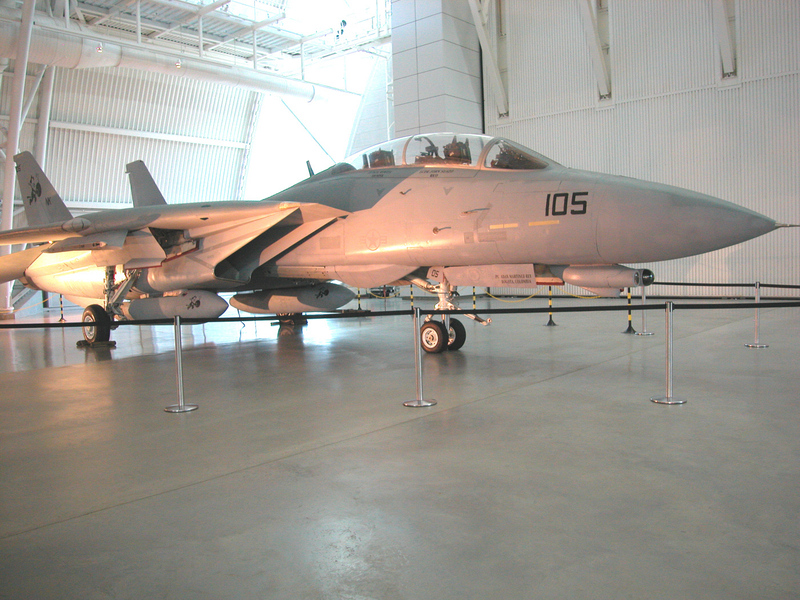 The museum’s F-14D (R) is on display at the National Air and Space Museum's Steven F. Udvar-Hazy Center, having been cleaned and made ready for display with the help of the Navy’s VF-31 squadron technicians. It is credited with one MiG kill during a fleet defense mission near the coast of Libya, ca. 1989. The Grumman F-14D (R) on display at the Smithsonian National Air and Space Museum's Steven F. Udvar-Hazy Center. The F-14D(R) Tomcat is a supersonic, twin-engine, variable sweep-wing, two-place strike fighter manufactured by Grumman Aircraft Corporation. The multiple tasks of navigation, target acquisition, electronic counter measures (ECM), and weapons employment are divided between the pilot and the radar intercept officer (RIO). Primary missions include precision strike against ground targets, air superiority, and fleet air defense. As a Strike Fighter, the Tomcat is capable of deploying an assortment of air-to-ground ordnance (MK-80 series GP bombs, LGBs and JDAM) in various configurations, while simultaneously carrying the AIM-7, AIM-9 and AIM-54 air-to-air missiles. The F-14D also has the LANTIRN targeting system that allows delivery of various laser-guided bombs for precision strikes in air-to-ground combat missions and for battle damage assessment. With its Fast Tactical Imagery (FTI) system the F-14 can transmit and receive targeting/reconnaissance imagery in-flight to provide time sensitive strike capability. This F-14D is also capable of carrying the Tactical Air Reconnaissance Pod System (TARPS) providing in-theater tactical reconnaissance. The National Air and Space Museum's Tomcat (BuNo. 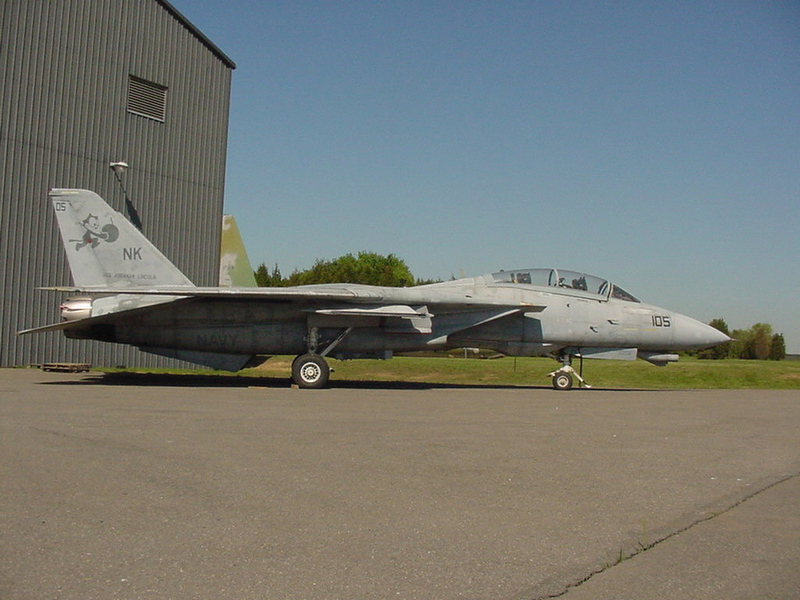 159610) was built as an F-14A-85-GR and was one of the few Tomcats that was modified as an F-14D(R) in the early 1990s. It is credited with one MiG kill which was earned on January 4, 1989, near the coast of Libya. On January 4, 1989, near the Libyan coast, Two VF-32 F-14As flying CAP from the USS John F. Kennedy (CV-67) are alerted to a pair of Libyan Mikoyan-Gurevich MiG-23 Floggers. The MiG-23s had taken off from Al Bumbaw Airfield near Tobruk. The F-14s locked the MiGs with their powerful AWG-9 radar. Normally such a radar lock resulted in the MiGs retreating back to Libya--not this tme. The Tomcats were threatened by the AA-7 Apex missile-carrying Floggers and were cleared to engage the MiGs. During a lengthy six- to eight-minute air battle, the MiGs continued to threaten the Tomcats and finally, after several attempts to evade the MiG radar threat, the incoming pair of MiG-23s were declared hostile and the F-14 crews were cleared to engage. The crew of the lead F-14A, AC202 fired an AIM-7 Sparrow missile which did not stike its target, while the second F-14A's, AC207 (BuNo. 159610) AIM-7 found its target destroying one of the MiG-23s. The lead F-14 re-engaged the remaining MiG-23 firing an AIM-9 Sidewinder heat-seeking missile which detonated in the tailpipe of the Flogger. Both MiG pilots ejected safely from their destroyed aircraft. On January 4, 1989, near the Libyan coast, Two VF-32 F-14As flying CAP from the USS John F. Kennedy (CV-67) are alerted to a pair of Libyan Mikoyan-Gurevich MiG-23 Floggers. The MiG-23s had taken off from Al Bumbaw Airfield near Tobruk. The F-14s locked the MiGs with their powerful AWG-9 radar. Normally such a radar lock resulted in the MiGs retreating back to Libya--not this time. The Tomcats were threatened by the AA-7 Apex missile-carrying Floggers and were cleared to engage the MiGs. During a lengthy six- to eight-minute air battle, the MiGs continued to threaten the Tomcats and finally, after several attempts to evade the MiG radar threat, the incoming pair of MiG-23s were declared hostile and the F-14 crews were cleared to engage. The crew of the lead F-14A, AC202 fired an AIM-7 Sparrow missile which did not strike its target, while the second F-14A's, AC207 (BuNo. 159610) AIM-7 found its target destroying one of the MiG-23s. The lead F-14 re-engaged the remaining MiG-23 firing an AIM-9 Sidewinder heat-seeking missile that detonated in the tailpipe of the Flogger. Both MiG pilots ejected safely from their destroyed aircraft. Transferred by the United States Navy. deck-launched, supersonic, twin-engine, variable sweep wing, two-place fleet defense and strike fighter.